Hatiora salicornioides (Haworth) Britton and Rose, Stand. Cycl. Hort. Bailey 3: 1433. (1915). Style - yellowish; stigma-lobes 4 or 5, white. Type locality; Recorded originally from the West Indies in error. The plant grows on trunks of trees, its roots long and fibrous, 4 dm. long or more and wrapped about the trunk of the tree; at first it is erect, then spreading and finally pendent; it is then a meter longer or more and very much branched; main stem and branches 5 to 10 mm. in diameter, made whorls of 2 to 6. DISTRIBUTION Brazil (Bahia?, Minas Gerais, Espirito Santo, Rio de Janeiro, Sao Paulo, Parana): epilithic and epiphytic in camporupestre, Atlantic and seasonal forest, near sea level to 1850 m altitude. 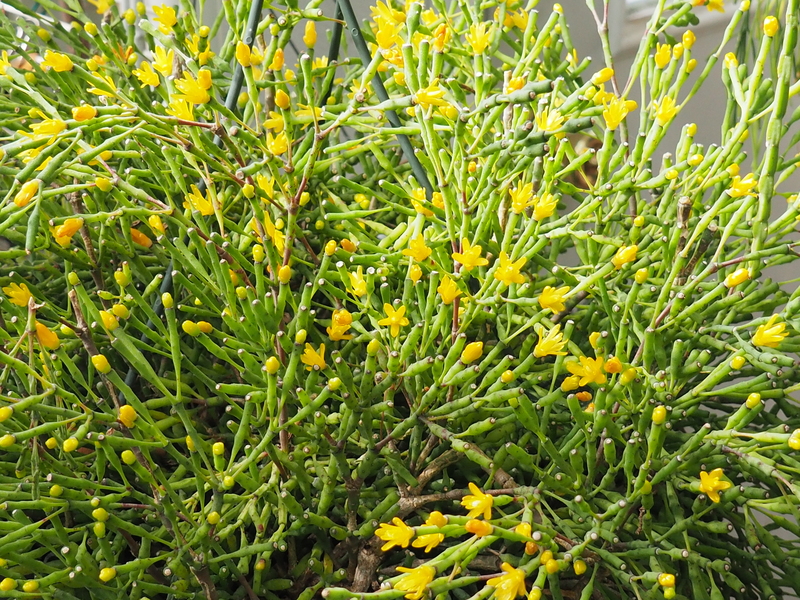 Plant with erect branches, many joints, joints very short, club shaped but joined by the thicker end, tubular, angled, smallest of hairs, flowering at the top, flowers solitary. In tropical America. Petals 7 – 10, acute, yellow, Stamens longer thatn the Style. Fruit unknown.